Measuring a hoop can be challenging, especially if you are new to the sport. The typical rule of thumb is that it should reach just above your naval when it is placed on the ground, but that rule isn’t always universal. 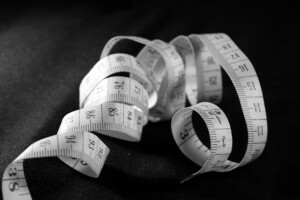 Given that many of us now-a-days are a bit wider around the midsection than we’d like to be, take your waist size into account when measuring your hoop. If you have a thicker waist, go a little bit bigger. Here is a great resource for determining the appropriate hoop size.